Hide deals from seller "Happenings Family Fun Center"
Limit 1 per person and 1 per transaction. Valid toward activities. Full value of Gift Certificate must be redeemed in 1 transaction. 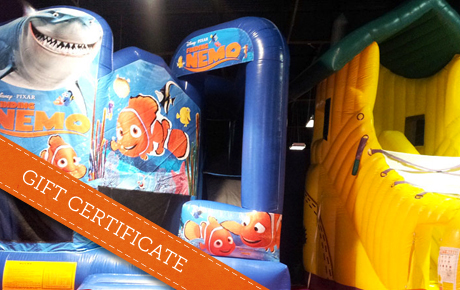 Enjoy a day of family fun with 50% off a $50 Gift Certificate to Happenings Family Fun Center in Palatine. This 30,000-square-foot facility boasts loads of fun for the young and the young at heart. Happenings has been open for just one year, but has already made a name for itself as a great family destination. With inflatable gyms for kids, a dance club designed for teens and an arcade with Xbox consoles for adults, this center has everything you need for a day of fun-filled activities. Their birthday packages make party planning easy, and the ample entertainment ensures that all your guests will have a great time. Family fun center in Palatine offering arcade games, batting cages and more.